cron jobs linux cron jobs cronjobs in php example cron job logs cron jobs cpanel cron jobs every 30 minutes how to cron jobs php cron job freely 30 second setcron job account Setcron job gold account how to know cron is running modify cron jobs free cron jobs set cron jobs free 7200 execution per day. Cronjob so called scheduler which mean when you want to execute particular task to your file that this work will be done or this file will be execute automatically after that specific time set by you than you put that file in cron jobs services. Setting cron jobs on php file is very easy you can also get it freely from your cpanel if you have a hosting account. If you have cpanel Linux base then you can configure and start cron job by putting complete URL bar of your file and setting the schedule time for it. For working with how to start cron job separately if you want to execute it fast then below is given method in which you don’t need any website for it you can simply add an extension bar into your browser and work with if for more how to start cron jobs and check is it working? See how to modify Cron job manually. Here you will learn how you can get 7200 scheduler jobs per day for freely. And you can set cron job for 1 minute and also you can set it at 30 second easily. To set your schedule task for your bot file script you should see this site. 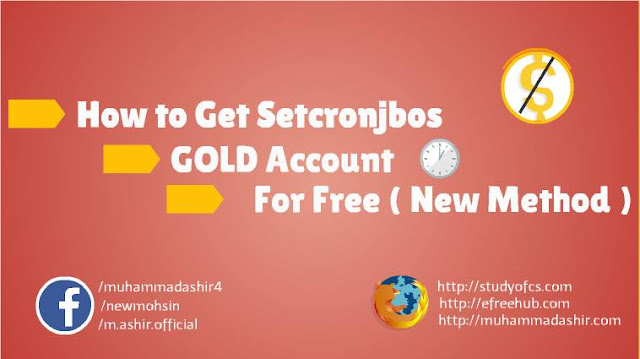 To get 30 second execution on setcronjob site freely you must connect it with your ruby account. By connecting it you will become a subscriber of Gold Account. Few things are need to get 1 minute or 30 second cron job. Your Name, email address your phone number. For this purpose we are using temporary email. Verify and confirm your account. Login to your account and here you will see connect with ruby account click on it. Now sign up here with your email address, confirm this account. Refresh the setcronjob tab. And hit on connect with Rubby account. Click confirm. And now you will get 7200 execution per day .these execution will help you to run your facebook bot script or any other script at 30 second. You can also modify the time by clicking on edit button. And to check is your cron job succeefully execute or fail click on Logs button and see your file output. Enjoy!